Part of an occasional series in which Spank The Monkey travels to foreign countries, watches films in unfamiliar languages, and then complains about not understanding them. This episode: Germany and Italy, March 2016. Hopefully by now you’ve read A Grand Tour, in which The Belated Birthday Girl and I described the fun to be had at Bavaria Filmstadt and Cinecittà. The studio tours were just two of the many highlights of our ten-day Easter break in Munich and Rome. Along with minor places of interest like the Colosseum and the Residenz, we also made sure we took in a local movie in each city. Obviously, this makes for a Monoglot Movie Club without the usual connecting thread of all the films coming from the same country, or being in the same language. Nevertheless, there are some overlaps: both films are set in ridiculously picturesque locations, both have little surprises buried in the end credits, and both are comedies with a surprisingly dark undercurrent. How dark? Well, let’s look at the opening scene of Der Geilste Tag. 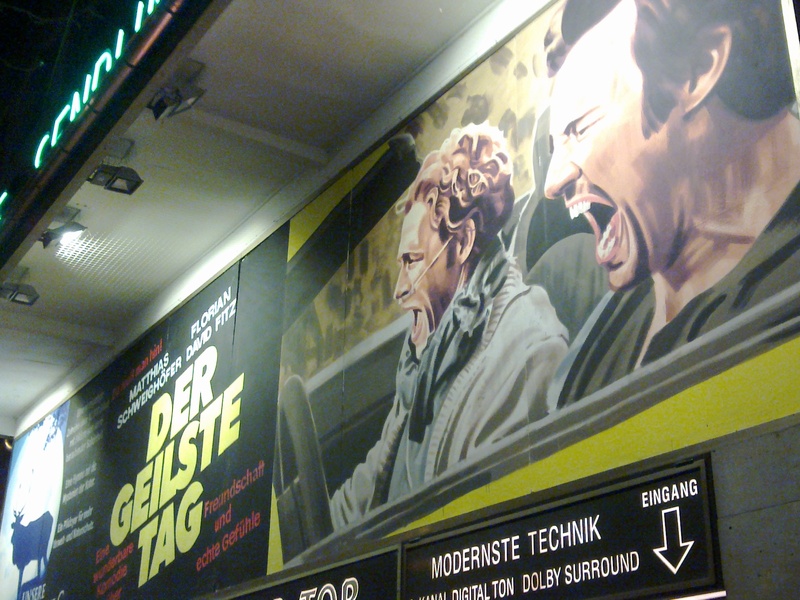 (We saw this at the Filmtheater Sendlinger Tor in Munich: delightfully, it’s one of those cinemas that paints its own movie posters, as you can see above.) Our protagonists, Andi (Matthias Schweighöfer) and Benno (Florian David Fitz), are sitting in the blazing sun on an African mountaintop, with one of them pointing a loaded gun directly at the head of the other. It’s the sort of scene that calls for a ‘several weeks earlier’ pullback, and that’s exactly what we get, as we’re introduced to the pair in more detail. Benno is charming but dodgy, has an estranged family in his past, and is prone to episodes of narcolepsy whenever they’re likely to cause the biggest laughs. It’s after one of these episodes that he’s notified of the brain tumour that’s been discovered in his CAT scan. And then there’s Andi, who looks more obviously like a terminally ill person. He’s coping with his condition by constant vlogging, but that doesn’t stop him being a complete nervous wreck. When the two of them find themselves in the same hospice, a tentative bond is formed which blossoms into a plan for a bucket list-type adventure. They raise money by selling off items purchased through credit they don’t have the life expectancy to make good on, run off to the airport and choose a destination through random pointing at the departures board. Mind you, as the South African Tourist Board has a hefty production credit in the opening titles, it’s not that much of a surprise when the guys find themselves in Mombasa and driving towards Cape Town. Fox is smart enough to realise that it’s the dynamic between his two wildly mismatched leads which makes the film fly, and he lets that run for as long as he can. For me, at least, there was a third act reversal that came out of the blue when the significance of their destination is suddenly made apparent, which changes that dynamic significantly. Thinking it through afterwards, I suspect there was at least one dialogue scene that set the audience up for what was coming up later on. But my lack of German made me as oblivious to that plot turn as one of the main characters, so if anything my ignorance made it more dramatically interesting. Meanwhile, in Italy, we have Un Paese Quasi Perfetto, directed by Massimo Gaudioso. 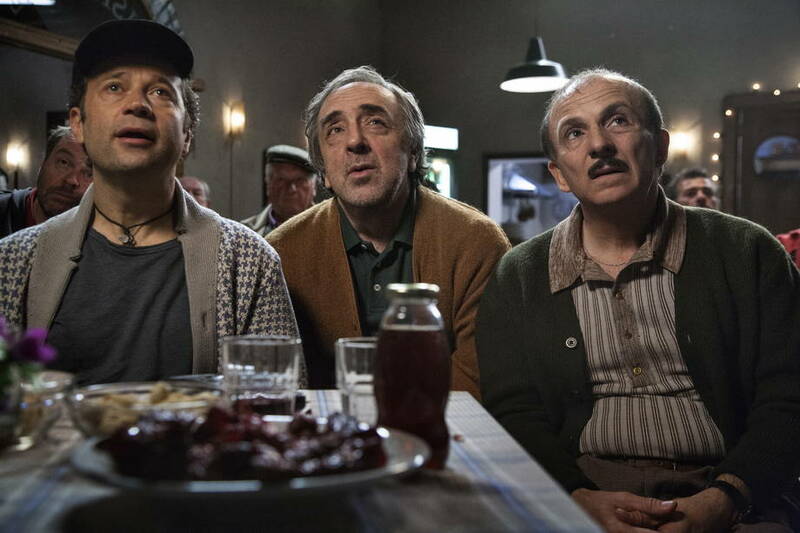 It’s another film with a perfect location (title notwithstanding), a small mining town in the Dolomites. More accurately, it’s a former mining town: the pits closed some time ago, and the men are all out of work, with the exception of the one who hands out everyone’s dole money and has to cope with the nickname ‘bancomat’. It’s getting to the point where the men with young families are forced to move out just so they can survive. Town boss Domenico (Silvio Orlando), however, has a plan to revitalise the place. You’re probably going to want to know what that plan is. Well, I have a series of events I can tell you, but I can’t quite make them flow into a coherent narrative. The ultimate goal is to get a new factory built in the town. To do this, they obviously need seed capital: but they also need to recruit a doctor, as the town doesn’t currently have one. Domenico somehow lures Dr. Gianluca Terragni (Fabio Volo) over from the big city for a temporary residency. Once he’s there, Domenico uses every means possible to ensure he stays, most shockingly by tapping Terragni’s phone so that his every need can be pre-empted. (In a situation that feels somewhat familar to me right now, it transpires that Terragni is a big cricket fan, so the townsfolk have to deduce the rules of the game from an English language webpage.) There’s also some sort of official town inspection, which requires 120 people to secretly run between buildings to make it look more populated than it really is. It’s the Italian equivalent of an Ealing comedy, isn’t it? A portrait of a community whose bucolic surface hides a shockingly cynical approach to getting what they want. It doesn’t feel particularly Italian, and at the end you discover why: it’s a remake of a 2003 foreign film called La Grande Seduction. But that one line in the closing credits has a huge amount of unspoken history behind it. The 2003 original was a French-Canadian production, which had a limited UK release under the title Seducing Dr Lewis. It was subsequently remade in English in Canada a decade later, with Brendan Gleeson and Taylor Kitsch in the leads: it was remade again in France in 2015: and now there’s an Italian version as well. Watching the trailers of all four versions back to back becomes an almost psychedelic experience. Try it. I can’t quite explain why, but once I’d discovered that this unassuming little film was in reality the fourth episode in an international franchise, it took some of the shine off it. It shouldn’t do, really, because it’s a perfectly fine movie in its own right. Silvio Orlando’s gloriously craggy face and charming performance hold it all together, even if like me you spend most of this film trying to remember what else you’ve seen him in. (Aside from him being a regular in Nanni Moretti’s films, he was also on posters all over the Rome subway at the time advertising an upcoming play.) He’s a big enough presence to reduce the nominally top-billed Fabio Volo to just another member of the admittedly rock-solid ensemble cast. The story chugs along quite nicely, and you know things are going to more or less work out by the end. Nevertheless, it should be noted that if the Wikipedia synopses of the Canadian versions are to be trusted, the Italian remake deviates from the original in the final reel. The flat-out feelgood ending that the Canadians wanted has been replaced by something that initially looks like a bleaker conclusion, but then ingeniously pulls together a couple of earlier story strands into something even more guaranteed to leave a big daft grin on your face. Combine all this with the ravishing Dolomite scenery – which becomes part of the justification for the changed ending – and it makes for a very enjoyable movie indeed, even if some of the whys and wherefores of the plot still elude me. You do find yourself wondering, though: why stop at four? This is such a flexible story that any country could remake it – you just need the right combination of elder statesman actor playing the town boss, and younger star in the role of the doctor. Perhaps you could have an Indian remake with Amitabh Bachchan and Aamir Khan. Or a Japanese one with Takeshi Kitano and anyone from a boy band that’s free this week. Or a Scottish version with Denis Lawson and Peter Capaldi. No, wait, that’s Local Hero. (Besides, people would probably complain that Capaldi’s too old to play the doctor.) Anyway, as long as it’s made in a language other than English, you’ll get to hear about it here first.